I am a huge fan of Thai dipping sauces. Not only Thai but also Vietnamese. There is something about the perfect balance of sweet, sour, and spice that when served with sticky rice or grilled meat, well, let’s just say it is a game changer. 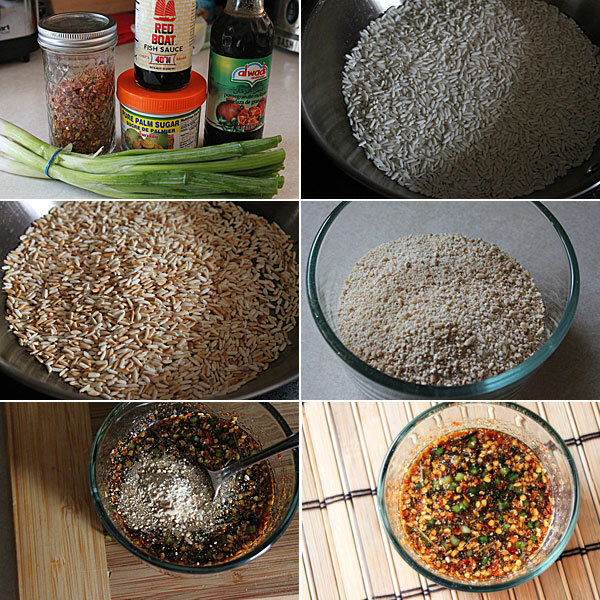 I’ve made some pretty darn good sauces in the past such as the Thai shallot sauce, the Thai Three Sauce, or the classic Thai dipping sauce, but this sauce in particular really stands out. It’s known as nam jim jaew and what separates it is the additions of toasted rice and spring onions. Now typically you would use tamarind pulp for this recipe, however I was out and decided to use pomegranate syrup as it yields the same texture and sourness to the dish. Did I mention it was just as awesome? Regardless, add everything to a small mixing bowl, and with the back of a fork, mix everything together, ensuring that the palm sugar thins out. 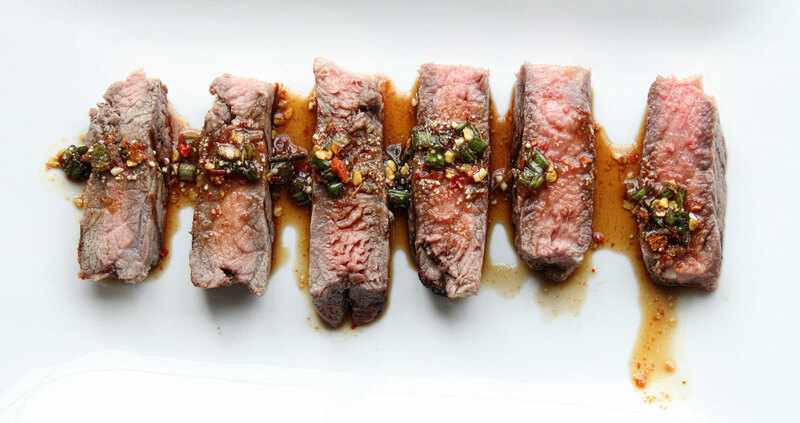 Add the sauce into a small serving dish and serve alongside any grilled meat. This stuff is addicting. I was actually eating it by the spoon, and I’m not kidding about that. I probably used about 5 different spoons as it was hard to hold back. When paired with the grilled beef, well, you are just going to fall in love. Hope you enjoy! I really need to give this a shot. Also, can’t help but commend you on your perfect medium rare. It’s usually the first thing I notice when I see beef sliced up. I’m a sucker for that pink centre. Haha.